Georgia garage/punk rock band the Black Lips will speak about the modern-day music industry at a forum at Loyola University New Orleans Monday, Feb. 25 at 5 p.m. Moderated by Instructor of Music Industry Studies Billy O’Connell, the forum will also address how the band gained success and their tour of the Middle East. The event is free, open to the public and will take place in Nunemaker Auditorium in Monroe Hall. For those unable to attend in person, the forum will be available via live streaming on Loyola’s website. A rough mishmash of blues, rock, doo-wop, country and punk, the Black Lips have slowly built a fan base that appreciates their energy and style. Since their founding in 2000, they have gone through several incarnations, and the current roster includes bassist Jared Swilley, drummer Joe Bradley, guitarist Ian Saint Pé and vocalist/guitarist Cole Alexander. Their debut full-length album, “Black Lips!” was released on Bomp! Records in 2003, and the group has since gone on to release numerous records. 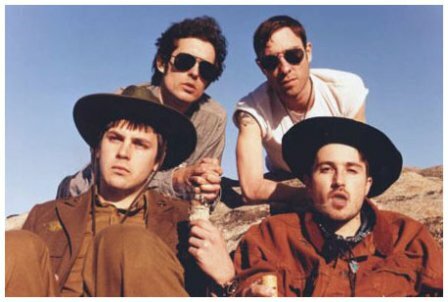 Currently signed to VICE Records, The Black Lips have completed multiple tours around the U.S., Asia and Europe. In 2007, they traveled to Israel and Palestine to play for Israeli radio. The event is part of the student-organized “Get Inforumed” series, a weekly forum throughout the spring featuring experienced music professionals from across the industry. Each event is designed to excite the community of creative minds and art entrepreneurs through conversations with the most experienced, sincere and relatable professionals in the industry. For more information, contact Lukas Cox.